Mastodon have shared their contribution to Game of Thrones‘ Catch the Throne II mixtape which this time has both hip hop and heavy rock. (But not both at once, for that grab the Judgement Night soundtrack.) Much like the plot of the HBO series, “White Walker” takes its time building to a climax. The lyrics seem to be vaguely about the zombie hoarde in the North, though with lines like “They come down The Wall to save us all,” Mastodon may have a different interpretation of what’s going on than most of us. Stream it below. Talib Kweli offered up his Catch the Throne II contribution, “Lord of the Light,” last week and the whole thing (including tracks from Anthrax, Estelle, Method Man and more) will be online March 17. 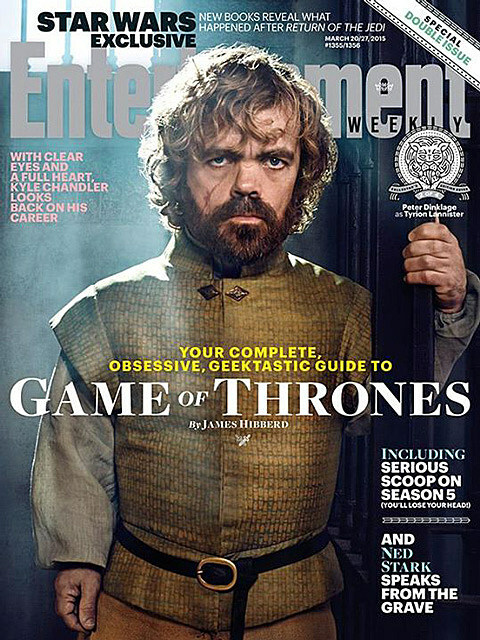 Elsewhere: this week’s issue of Entertainment Weekly has Game of Thrones on the cover (four different covers, actually, that’s Tyrion’s above) and that will be out March 12. And there’s a brand new trailer for the upcoming fifth season of Game of Thrones (premiering April 12 on HBO) which you can watch below….